PCB Impedance: Controlled Dielectric vs Controlled Impedance? Controlled Dielectric or Controlled Impedance? 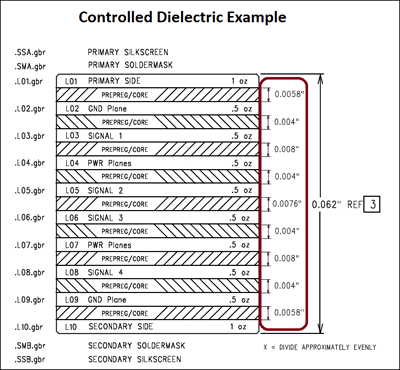 Confusion abounds regarding the topics of controlled dielectric and controlled impedance in the printed circuit board industry. We will try to clarify the subject. What is the difference between Controlled Dielectric and Controlled Impedance regarding PCB fabrication? The purpose of controlling dielectric or impedance is essentially the same, to achieve a target impedance on one or more signal lines on a printed circuit board. For example, your design has a USB signal pair that must have an impedance of 90 ohms (±10%) to function properly. To make sure this will happen, there are many factors that need to be considered and calculated such as trace width, spacing between copper features on the same layer, distance between copper features on other layers, the Dk (dielectric constant) of the laminate used to manufacture the board, as well as a few other factors. If you are an adventurous Electrical Engineer and you'd like to tackle the calculations yourself, you would be taking the Controlled Dielectric approach to control your own impedance. After making all the necessary calculations, you would need to specify in your fab exactly what dielectric spacing is needed between your copper layers as well as layout your traces with the correct trace and space. From a printed circuit board manufacturing perspective, all we would need to do is follow your design to meet your impedance. On our PCB Prime, Inc. Quote Form, you would need to select CONTROLLED DIELECTRIC since we would not be recalculating the impedance for you, nor testing the board to ensure the impedance is met. We would print the copper features on your board as we see them in the Gerber and use the dielectric stack that you specify. If you would rather have our engineers calculate the impedance for you, we would need to know which traces need to be controlled, what impedance is required and in reference to which copper layers. Select CONTROLLED IMPEDANCE on the Quote Form. Tip: The easiest way to specify which traces need to be controlled is to make these traces a unique trace width such as 6.5 mils. Even if you have hundreds of 6-mil wide signal lines on your board, we can easily search the Gerber for a specific width to find the 6.5-mil critical lines. If the impedance traces are the same width as many other traces, it will be very difficult to determine which traces are to be controlled. When ordering a board with Controlled Impedance from PCB Prime, Inc., we take the math out of the equation. We will calculate and correct your trace and space, use the correct dielectric spacing between your layers, and run a TDR test to confirm the correct impedance is met. If you have any questions, please contact us. The definitions for these topics are below. Dielectric – The measure of resistance to the flow of electrical current, usually expressed as Dk (dielectric constant). Dielectric can also mean an electrical insulator that can be polarized by an applied electric field. When a dielectric is placed in an electric field, electric charges do not flow through the material, as in a conductor, but only slightly shift from their average equilibrium positions causing dielectric polarization. Because of dielectric polarization, positive charges are displaced toward the field and negative charges shift in the opposite direction. This creates an internal electric field, which reduces the overall field within the dielectric itself. 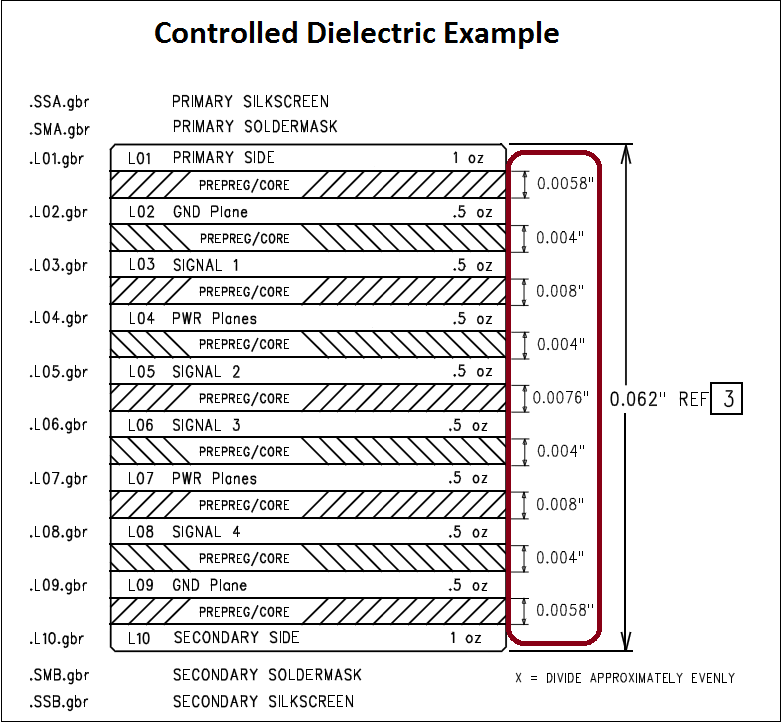 To a PCB manufacturer, a controlled dielectric implies that specific thicknesses between layers are required. Controlled Impedance – The matching of substrate material properties with trace dimensions and locations in an effort to create a specific electrical impedance for a signal moving along a trace. Controlled impedance implies that the PCB is manufactured so that the impedance of traces is within a certain percentage of a specified value. Time Domain Reflectometry (TDR) – A measure of the reflections and spurious signals in a conductor arising from the source coupling into non-ideal impedances (e.g. the connecting wiring and termination). It is a common test used for high-speed digital and analog work. © 2018-2019 PCB Prime. All rights reserved.